ASU Startup Accelerator now accepting applications for next cohort. 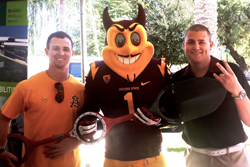 Bosse Tools, which makes ergonomic garden, landscaping and construction tools, is one of the Arizona-based startup companies benefitting from the ASU Startup Accelerator. The ASU Startup Accelerator provides invaluable connections, resources and guidance for Arizona’s emerging ventures. Are you an Arizona entrepreneur with a budding venture you’re ready to take to the next level? Could your great business idea benefit from mentorship, exclusive access to training and workspace, and the opportunity to secure funding from investors? If so, apply to be part of the next cohort of Arizona State University’s Startup Accelerator program. Applications are due May 30, 2014, and space is limited. Based at ASU SkySong in Scottsdale, the ASU Startup Accelerator strategically supports and guides startup companies as they develop products and services, build a customer base and secure funding. Arizona-based ventures in all sectors are encouraged to apply. The program is open to both ASU and non-ASU applicants, including students, faculty, staff, alumni and community members. The accelerator, which was created and is managed by ASU’s Entrepreneurship and Innovation Group, has been designed to nurture companies from all sectors. Participants in the current cohort are commercializing technologies ranging from mobile railroad crossings (Rail X) and nanocrystalline magnetic materials (Rayn Innovations) to customizable financial services (Set for Life Financial) and molecular medical diagnostics (Iron Horse Diagnostics). The interaction among participants working on diverse technologies and the different perspectives they share with each other are unique strengths of the program. Teams interested in participating in the ASU Startup Accelerator must complete an online application describing their business model, team and target market. Companies will be selected based on the nature of their business idea and the team behind it and are not required to have any affiliation with ASU. In recognition of the innovation ecosystem that ASU has created, U.S. News and World Report recently ranked ASU second among the country’s most innovative schools. Participants in the ASU Startup Accelerator will directly benefit from the resources and entrepreneurial spirit that have created this ecosystem. Apply now to be part of the ASU Startup Accelerator and maximize the potential of your business with mentorship from experienced entrepreneurs, training and resources designed specifically for startups, and opportunities to secure funding. Apply online by May 30, 2014.